Aggregating the number you’re actually working with already and finding out whether it’s above a billion (in which case you’d want to summarise to whatever number of billions it is), or above a million (in which case you’d want to summarise to whatever number of millions it is), and so on. Converting it to an absolute number so that it works for negative numbers too. Taking that aggregated number and dividing by the sensible unit. For example, if your number is 34000000, you’d want to express it as 34 million, so we’re dividing it by a million to return 34. Rounding that divided figure to one decimal place. This is just my preference, you can do what you like! Set the number to 0 for no decimal places, or 2 for two decimal places, etc. Convert that number to a string. Add a text unit abbreviation to the end of it. Of course, you can also add trillions, quadrillions, and so on, if that’s what your data requires. Now, I’ve deliberately aggregated everything within the calculation, and I’m only using it for labelling purposes. I categorically do not recommend aggregating outside this calculation or using this calculation for calculating anything else. This will result in a shitstorm of rounding errors which can seriously damage your data. But as a final step once you’ve sorted everything out, I find that this is really nice for presenting data. STR(ROUND(AVG([Population Total] / 1000000000), 1)) + "b"
STR(ROUND(AVG([Population Total] / 1000000), 1)) + "m"
STR(ROUND(AVG([Population Total] / 1000), 1)) + "k"
Time is money, money is power, power is pizza, and pizza is knowledge. I’m not proud to admit it. I was recently in a pub and pulled out my phone to calculate the area of a set of pizzas we were ordering. There were two sizes of pizza on the menu – 12″ and 18″, for £12 and £18 each – and my group were going to order five 12″ pizzas. I couldn’t let that slide. Intuitively, it feels wrong. Yes, an 18″ pizza is bigger, but surely five 12″ pizzas are more than only three 18″ pizzas? This is when I worked out the total area of the pizzas and their price per square inch, and for the record, buying three 18″ pizzas at £18 gets you 763 sq inch of pizza for £54, whereas buying five 12″ pizzas at £12 gets you 566 sq inch of pizza for £60. We bought the big ones. From here on out, it was relatively straightforward. It’s really hard to accurately judge area when looking at circles and squares (which is one of the reasons I hate packed bubbles and tree maps), so I started out by visualising the pizzas as actual circles vs. bar graphs. I really enjoyed playing around with this viz. People who use Tableau often talk about liberating your data, but this was a nice exercise in what’s possible with basically no data at all! Ever thought of tracking whether something’s hitting the target by showing an actual target? I was looking through some old radial blogs recently, and realised you could use a scatterplot on x-y coördinates to show accuracy on a bullseye target. 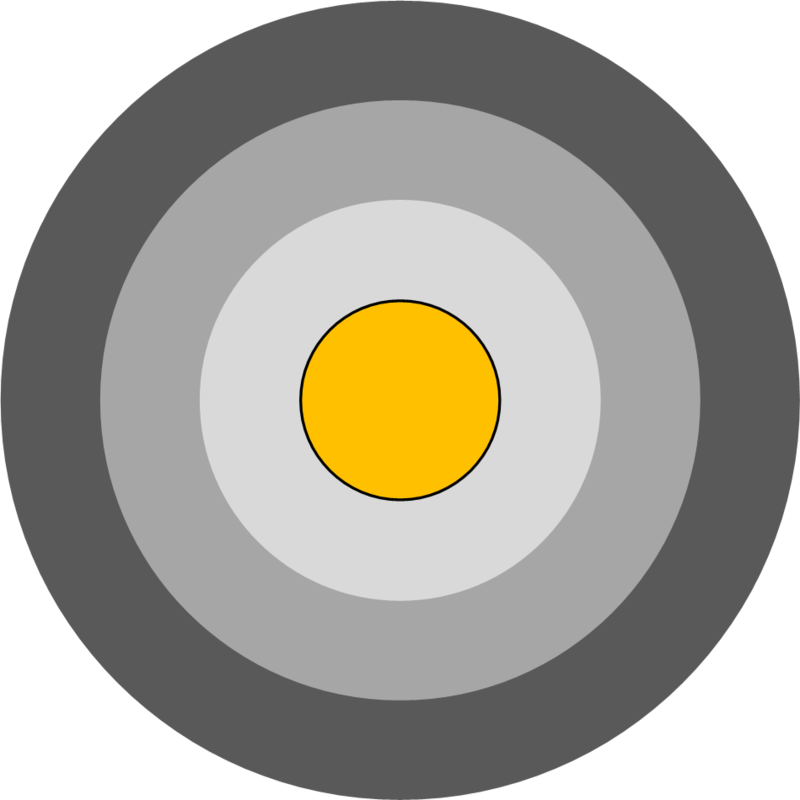 I used MS Publisher to design these concentric circles in the background image because when you select them all and save as an image, it doesn’t save the blank space as white, so you can use it with any colour worksheet or dashboard. Feel free to download this target image here (and if you use it, give me a shout! I’d love to see what kind of cool things you’re using it for). The next thing to do is calculate the “accuracy” on the bullseye; the nearer the sales figure is to the target, the closer to the middle of the bullseye it should be. However, once you’ve met or exceeded your target, you don’t want the points to keep moving. Countries with sales at 101% of the target and at 300% of the target should both still be in the middle. The exact middle of the target is going to be at coördinates (0,0), which means that we actually want to create a field which takes some kind of inverse of the accuracy, where the greater the accuracy, the smaller the number in that field. So, let’s create the following calculated fields. I’ve adapted them a bit from this blog on radial bar charts so that you can put the X field on columns and the Y field on rows, which is more intuitive. Why have I set the Accuracy equaliser bit to 1.05 instead of 1? And why have I set the Radial Field calculation to 1.1 instead of 1? Well, it’s a bit fiddly, but it’s about plotting. I want everything where Sales is 100% of Target or more to be in the gold bullseye, so I want that to fill a certain amount of space. If I set the Accuracy equaliser bit to 1 and the Radial Field calculation part to 1, then it plots everything that’s at 100% or more at (0,0) and includes everything that’s 90% or more in the gold bullseye. I want to space out the 100% or more points so that they’re not on top of each other, and I want only the 100% or more points to be included in the gold bullseye. Setting the Radial Field calculation part to 1.1 makes it so that the edge of the gold bullseye denotes 100%. That means that the 100% or more points will be plotted on the edge of the bullseye. So, the 1.05 part in the Accuracy calculation moves those points further inside the bullseye, but not into the exact middle where they’ll be on top of each other. While I’m at it, there’s a limitation to the Accuracy calculation. Have you spotted how it’s [Sales] > [Target] rather than SUM([Sales]) > SUM([Target])? This is because the angle calculation needs to aggregate the Radial Field further, and will break if the Accuracy or Radial Field calculations are already aggregated. This means that you’ll probably need to do some data processing to make sure that it’s just one row per thing in the dataset. The calculations mean you can plot the points in a radial way; it’ll go through whatever field you’ve put on detail, and plot the points the right distance away from the centre, starting at 12 o’clock and looping round clockwise. With Country, it’s done alphabetically, so Belgium is on the X axis zero line. If you want to order the points differently, you can add a numeric field to the detail shelf, and change the table calculation to compute using that numeric field (but make sure to keep Country there!). …but I actually kinda like them on this graph. I’ve also put Country on the colour shelf, and made the borders around the circles black. I haven’t seen this approach before, so I’m not really sure what to call it. I’ve plumped for a bullseye graph, but maybe it already exists under another name. Let me know if somebody else has covered this, and definitely let me know if you find this useful! You can download the Tableau workbook I used to make this example here (it’s 10.2, by the way, but the same approach should work for older versions). If you follow football, you often hear about arduous away trips to the other side of the country. This seems to imply that the further an away trip is, the more difficult it is for the away team. However, is that actually true? Do away teams really do worse when they’ve travelled a long way to get there, or is there no difference? The football league season has just finished, so I’ve taken each match result from the Championship, League One, and League Two in the 2016-17 season. After some searching, I got the coordinates of each football league team’s stadium, and used the spatial tools in Alteryx to calculate the distance between each stadium. I then joined that to a dataset of the match results, and you can download and play with that dataset here. I stuck that into Tableau, and you can explore the interactive version here. First, let’s have a look at how many points away teams win on average when travelling different distances. I’ve broken the distance travelled into bins of 25 miles as the crow flies from the away team’s stadium to the home team’s stadium, then found the average number of points an away team wins when travelling distances in that bin (I excluded the games where the away team travelled over 300 miles as there were only two match ups in that bin – Plymouth vs Hartlepool and Plymouth vs Carlisle). Teams travelling under 25 miles win just under a point on average, while teams travelling over 200 miles win between 1.3 and 1.6 points on average. Local rivalries. It’s possible that away teams do worse in derby matches than in other matches; this is something to investigate further. Team bonding. It’s possible that travelling a longer distance together is a shared experience that can help with team bonding. Southern economic dominance. England is relatively centralised, economically speaking; most of the wealth is in the south. Teams in the South travel further than average to away games, so perhaps the distance advantage actually shows a southern economic advantage; teams in richer areas can buy better players. Centralisation vs. sparser regions. England is relatively centralised, geographically speaking; most of the population lives in the bits in the middle, and teams in the Midlands travel the least distance on average. Perhaps teams in more centralised areas (e.g. Walsall, Coventry) have more competition for resources like new talent and crowd attendance, while teams in less centralised areas (e.g Exeter, Newcastle) might have less competition for those resources. Since I had the stadium details, I had a look at whether the stadium capacity made a difference. This isn’t a sophisticated analysis – better teams tend to be more financially successful and therefore invest in bigger stadiums, so it’s probably just a proxy for how good the home team is overall, rather than capturing how a large home crowd could intimidate an away team. Finally, this heat map combines the two previous graphs and shows that away teams tend to do better when they travel further to a smaller ground. This potentially shows the centralisation issue discussed earlier; the lack of data in the bottom right corner of the graph shows that there are very few big stadiums in parts of the country like the far North West, North East, and South West, where away teams have to travel a long way to get to. So, it looks like the further an away team travels, the better they tend to do… although that could reflect more complicated economic and geographic factors.